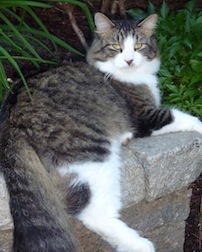 Missing since Saturday, July 26, 2014… Lorraine in the area of René d’Anjou (J6Z 4N1). His name is Abba, he is 4 years old. He is a beautiful big cat with a big long and bushy tail. He is declawed on all four paws (limps on his right front leg) and is wearing a red collar with his name and our phone number on the back. He is very affectionate with humans.